UC Davis kept one step ahead of the pack, Eastern Washington and Weber State kept pace, Idaho State stayed alive and Portland State continued its surge in the final weekend of October games across the Big Sky Conference on Saturday. Weber State won for the third straight week, posting a 35-30 win over No. 22 North Dakota in Grand Forks. 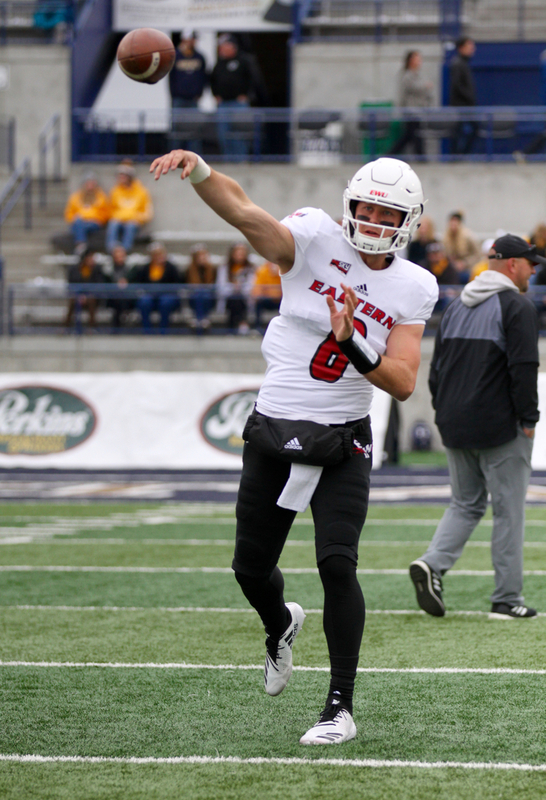 Eastern Washington head coach Aaron Best announced following a 38-14 win over rival Idaho that EWU senior All-American quarterback Gage Gubrud will miss the rest of the season due to surgery on his leg. UC Davis scored 46 points in the final 18 minutes, 24 seconds of its 49-21 win over Montana in Missoula. 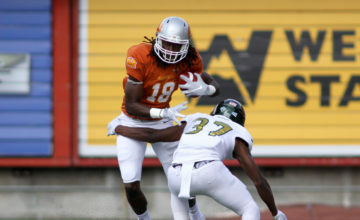 Idaho State built a 24-7 lead and endured a Montana State rally in a 24-17 win. The losses by the Montana schools are the fourth each for the Bobcats and Grizzlies. Both schools will have to win out and get help if each hopes to snap playoff droughts. But of course that’s impossible since the rivals meet to end the season in Missoula on November 17. Portland State is all of a sudden alone in fifth place in the Big Sky standings, a game behind Weber State, Eastern and Idaho State in the league standings. The Vikings won for the third straight time, pushing Sac State to 0-5 in league play and moving to 4-4 themselves. Wins by Northern Colorado over Southern Utah and Cal Poly over Northern Arizona means UNC, Cal Poly, NAU, Idaho, Montana State and Montana all enter the final month of the season with two league wins. Southern Utah is the league’s lone one-win team and Sac is the only team in the league that has not won a conference contest. The win is the third-straight for the Wildcats, who improve to 6-2 overall and 4-1 in Big Sky play with three games remaining. UND is now 5-3. The Fighting Hawks are playing as an FBS independent but have a 3-2 record against Big Sky competition so far this fall. The Wildcats had their best offensive showing of the season, totaling a season-high 450 yards with 318 passing and 132 rushing. North Dakota finished with 321 yards of total offense. Weber State was also a season best 8 of 16 on third down conversion attempts and scored on all four attempts in the red zone. Sophomore quarterback Jake Constantine threw for 318 yards and two touchdowns and ran for another, while redshirt freshman running back Josh Davis added 107 yards rushing and a touchdown. The Wildcats jumped out to a 14-0 lead after a Constantine seven-yard touchdown run and a 69-yard pass play from Constantine to Darryl Denby. On the ensuing kickoff, North Dakota’s Evan Holm returned the kick 99 yards to make it 14-7 Weber State early in the second quarter. UND tied the game with a touchdown with 4:28 left. 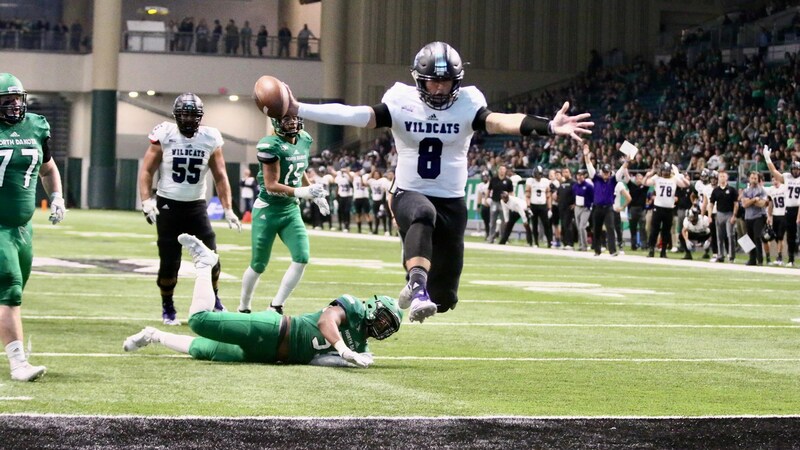 Weber State went back in front with a 15-yard touchdown from Constantine to Justin Malone with 43 seconds left in the half, but the Fighting Hawks went 70 yards in 27 seconds and scored on a 22-yard pass play with 12 seconds left. The extra point was missed and Weber State led 21-20 at halftime. The Fighting Hawks went back in front early in the third quarter on a 29-yard field goal, before Constantine found Denby again for a 13-yard touchdown to make 28-23 Wildcats after three quarters. Davis opened the fourth quarter with a three-yard touchdown pass that put the Wildcats up 35-23. The Wildcats attempted a field goal with 2:56 remaining when North Dakota blocked the kick and returned it 60 yards for a touchdown to make it 35-30. Denby finished with five catches for 107 yards and two touchdowns while Malone had a career-high seven catches and 76 yards. Defensively, Jawian Harrison had eight tackles, while Landon Stice had six tackles and an interception. WEber held a UND team that rushed for more than 450 yards last week to 105 yards rushing and 320 yards overall. The Wildcats return home next week for the final regular season home game of the year. Weber State hosts Sacramento State at noon on Saturday, Nov. 3 at Stewart Stadium. UND plays at Idaho next week likely needing to win out and get help to get an at-large bid to the FCS playoffs. Led by the arm and legs of sophomore Eric Barriere and another stellar effort by its defense, the Eastern Washington University football team jumped out to a 31-0 halftime lead and went on to defeat Idaho in the first matchup between the tradition rivals in Cheney since 1994. Barriere accounted for a career-high 396 yards of total offense – 266 in the first half alone – in Eastern’s 92nd-Annual Homecoming Game. Head coach Aaron Best announced after the game that All-American Gage Gubrud will be lost for the season with a lower leg injury which will require surgery, meaning Barriere is the Eagle starter moving forward. Eastern finished with 546 yards off offense in the school’s first-ever victory over Idaho in Cheney, having lost three previous meetings at Roos Field (formerly Woodward Field) against the Vandals. The defense did its part by holding Idaho to 363 yards and extended its string of scoreless quarters to five until giving up touchdowns in each of the third and fourth quarters. 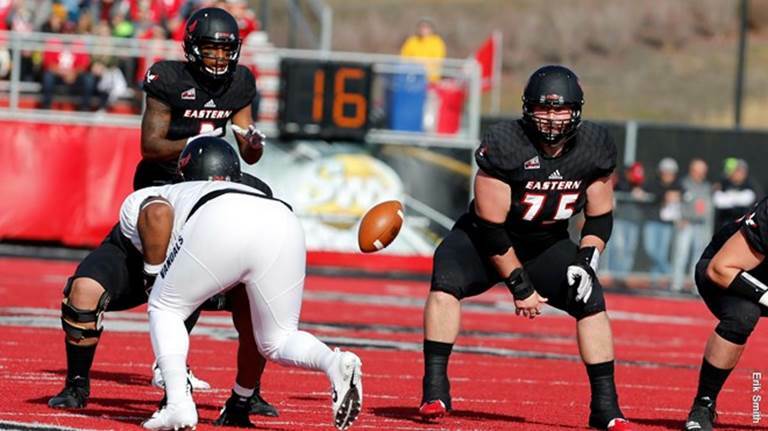 EWU has now registered shutouts in nine of 20 quarters in Big Sky play thus far. Eastern added extra bleachers to “The Inferno” this week, allowing a crowd of 10,023 to be on hand for home coming. Eastern has now had 29-consecutive sellouts at “The Inferno” (crowd in excess of 8,600). Eastern Washington is now 4-1 in Big Sky play, 6-2 overall. In their first year back in the Big Sky since leaving for the FBS following the 1995 season, the Vandals are 2-4 in league play, 3-5 overall. EWU plays a suddenly hot Northern Colorado next week with the Bears gunning for a third straight win following an 0-7 start. But the news of the day centered on the announcement that Gubrud’s career is likely over. At the beginning of the 2018 season, Portland State head coach Bruce Barnum said his young team would continue to get better as the season progressed. Those words are proving to be prophetic as the Vikings won their third straight game, defeating Sacramento State, 41-14, at Hornet Stadium. With the win PSU improves to 3-2 in the Big Sky Conference and moves into fifth place in the 13-team league. The Vikings are 4-4 overall after their third straight win. PSU lost 15 straight Division I games before a 22-20 win at Montana to start the current streak. Portland State also erased a three-game losing streak to the Hornets. PSU’s three-game winning streak is its first since the 2015 season. Portland State scored on its first possession of the game as Cody Williams kicked a 38-yard field goal. The score was set up by a 30-yard punt return by Beau Kelly – his longest of the season – that put PSU in Hornet territory. The Viking defense continued its fine play with a pair of three-and-out stops against the Hornets to start the game and forced three first-quarter punts. After that third punt, Jalani Eason came off the bench to engineer a 12-play, 91-yard scoring drive. Eason completed two passes for 25 yards, rushed twice for 17 yards, then Sirgeo Hoffman burst out on a 26-yard TD scamper. The extra point had PSU ahead 10-0 after one play in the second quarter. The Hornets finally got on the board on an exciting catch-and-run by Pierre Williams. The freshman wide receiver caught a 45-yard pass from Wyatt Clapper and snuck into the right corner of the end zone. Portland State wasted no time answering the Hornet score. On the next play from scrimmage, Davis Alexander tossed a good old-fashioned bomb to Mataio Talatemotu who did the rest of the work on an 81-yard touchdown pass. Romoe Gunt picked off his second pass of the season on Sacramento State’s next drive. The Vikings took over at the Hornets’ 49. The Vikings ran nine plays to cover the distance with Darian Green coring on a five-yard run. That gave PSU a 24-7 lead by halftime. The Vikings were moving smoothly on offense with 127 yards on the ground and 127 through the air by the half. Williams tacked on his second field goal of the game midway through the third quarter. This one came from 37 yards out and PSU led 27-7. Gunt came up with another big play early in the fourth quarter. As the Hornets were driving inside the Vikings’ 10-yard line, Houston Barnes tripped the ball away from the Hornets’ BJ Perkinson. Gunt pounced on it for his second takeaway of the game. Shortly after that turnover the Vikings put the game away. Eason broke through on a third-down-and-eight play for an 82-yard touchdown run. He added another electric 47-yard TD scamper later in the quarter and the Vikings rolled to an easy win. For the game, Eason rushed for a career-high 165 yards and two touchdowns on just seven carries. It was the most rushing yards by a Viking in 12 games. “We know he is a talent. He was the fastest player on the field. The two key offensive plays he had to keep our score in good shape were big,” said Barnum. Portland State had 341 yards rushing and a total offense of 546 yards. The Hornets totaled 383 yards and were forced into three turnovers. The Viking defense also forced six three-and-outs and blocked a punt. Gunt led the Vikings with eight tackles and the two takeaways. Barnes had seven tackles and a forced fumble. 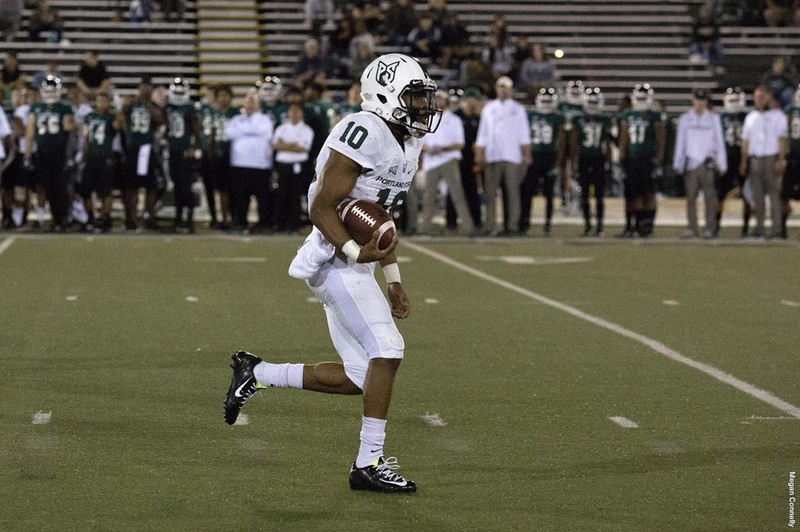 Elijah Dotson rushed 19 times for 183 yards and a touchdown to lead Sacramento State. The Hornets fall to 2-6 on the season, 0-5 in league play. Seven hundred and twenty-eight days ago Northern Colorado defeated Portland State in overtime in Portland. The clock since a UNC road win can rest to zero, after the Bears defeated Southern Utah 42-39 at Eccles Coliseum Saturday night. A Henry Stelzner interception with 15 seconds left sealed the deal. The Bears used their run game to lead them to victory rushing for 289 yards on the day. For the first time in the program’s Division I history, they had a pair of 100 yard rushers in Milo Hall (128 yards) and Trae Riek (118 yards). Northern Colorado came out fast and never looked back. The Bears defense forced a three and out their first two drives of the game and the offense responded with back-to-back touchdowns. Hall got the scoring started on the night for UNC with a 3-yard TD. He went on to add two more scores in the game from 19 and 24 yards out. Hall finished the game with 21 carries for 128 yards going over the 100 yard mark for the second straight game. Over the first two offensive drives of the game for each team, UNC out-gained SUU 132-9. Southern Utah scored eight straight as their defense and offense settled into the game during the second quarter. The Bears extended their lead back to double figures at the half when Keaton Mott found Theron Verna for 35 yards on a Hail Mary set up by a face mask call on Dante Jackson’s punt return. Northern Colorado scored 10 straight points to start the second half, opening their lead to 35-11. Southern Utah never gave in though, cutting the UNC lead to 42-32 early in the fourth quarter and to 42-39 with 45 seconds left. SUU had one final chance with 22 seconds left starting at their 15-yard line. Keifer Morris pressured the Thunderbirds quarterback and forced the pass that was picked off by Stelzner to secure the win. Senior fullback Joe Protheroe surged past the 1,000-yard mark for the second time in his Cal Poly football career and senior quarterback Khaleel Jenkins ran for two touchdowns and passed for two more as the Mustangs defeated Northern Arizona 38-28 on Saturday inside the J. Lawrence Walkup Skydome. 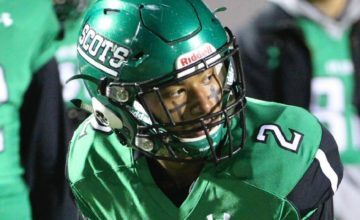 Protheroe rushed for 217 yards on 39 carries, joining an elite Mustang club of five former players who twice rushed for over 1,000 yards in a season. Protheroe, who scored once on a one-yard dive, raised his total for the 2018 campaign to 1,152 yards and for his career to 3,613, still No. 4 on the all-time Mustang list but just 65 yards behind No. 3 James Noble. Jenkins completed just three of six passes, but two of his completions resulted in 38-yard touchdowns to Quentin Harrison and J.J. Koski and the third was a 22-yarder to Koski that set up another Mustang score. 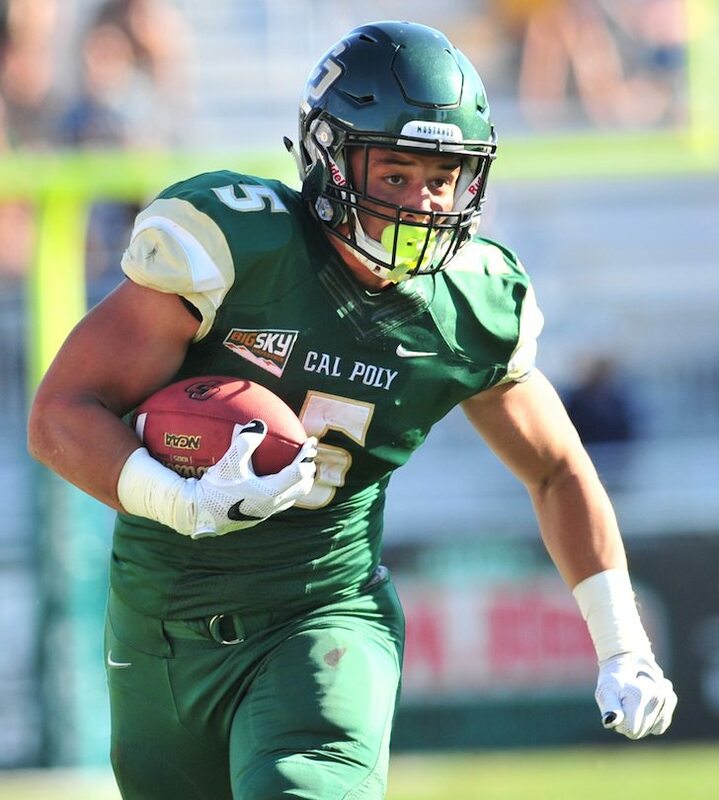 Jenkins also rushed for 103 yards, scoring on runs of 12 and one yards, as Cal Poly improved to 3-5 for the season and 2-3 in Big Sky Conference games. 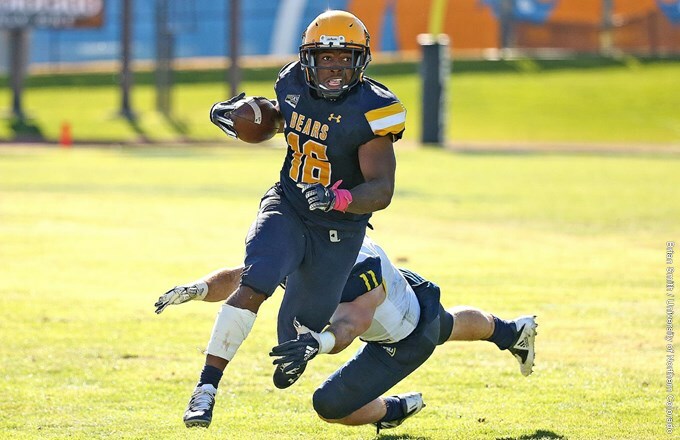 Northern Arizona, which has used four starters at quarterback this season, fell to 3-5 and 2-3. Cal Poly has beaten Northern Arizona just twice in 13 meetings. Both wins were in Flagstaff. The first victory clinched for the Mustangs the Big Sky title in 2012. Northern Arizona scored first on a seven-yard run by Joe Logan late in the first quarter. Cal Poly then scored the next 38 points of the game, three touchdowns on runs and two via the pass plus a 37-yard field goal by Alex Vega. Jenkins ran 12 yards for the first Mustang score, then hit Harrison and Koski with 38-yard touchdown passes. Protheroe’s one-yard run capped a 28-point second quarter for Cal Poly and a 28-7 halftime lead. 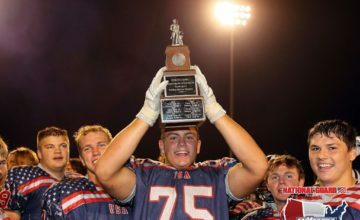 Vega’s field goal and the one-yard run by Jenkins gave the Mustangs a 38-7 advantage midway through the third period. Northern Arizona tried to climb back into the game with three touchdowns, a 20-yard pass from fourth-string quarterback Brandon Porter to Emmanuel Butler, a one-yard run by Jacob Mpungi and a five-yard run by Logan after a Mustang fumble, cutting Cal Poly’s lead to 38-28 midway through the fourth quarter. The Lumberjacks fired one more bullet, driving to the Cal Poly one-yard line before Dominic Frasch intercepted Porter at the 1 with 54 seconds left to clinch the victory for the Mustangs. It was Frasch’s second interception of the season. Cal Poly compiled a 441-418 advantage in total offense with 343 yards rushing and 98 yards passing. The Mustangs also had nearly a 10-minute advantage in time of possession. Linebacker Matt Shotwell earned double-digit tackles for the fourth time this season, collecting 11 against the Lumberjacks. Myles notched two tackles for lost yardage and forced a fumble. Frasch had the lone interception of the game. Cal Poly plays its final road game next week, visiting Montana State in Bozeman on Saturday. Kickoff is set for 1 p.m. Pacific. Recaps courtesy of Weber State sports information director Paul Grua, Eastern Washington SID Dave Cook, Portland State SID Mike Lund, Cal Poly SID Eric Burdick and Southern Utah SID Bryson Lester. Photos by Brooks Nuanez and attributed. All Rights Reserved.